After a hard day's work, you deserve to relax and put your feet up in this reclining love seat. Sturdy seats, performance fabric, one piece chaises and bustle backs provide support and comfort. 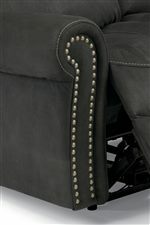 With exposed stitches and nail head trim on elegant rolled arms, this stylish love seat will look great in your living room. Use the power button on the side to easily recline. This piece is built to recline to any position even when placed just inches from your wall. The Daniel Cozy Power Reclining Love Seat with Nail Head Trim by Flexsteel at Crowley Furniture & Mattress in the Kansas City Area: Liberty and Lee's Summit, MO & Overland Park, KS area. Product availability may vary. Contact us for the most current availability on this product. Seat Back Bustle back provides comfort and support for your neck and back. Seat Tailored seats designed for exceptional comfort are composed of a high-resiliency, high-density polyurethane foam core wrapped in layers of soft polyester fibers. Recliner Mechanism This style features a zero wall proximity mechanism to allow you to open and recline in any position with the recliner positioned only inches away from the wall. The glider recliner allows you to either glide or recline. For your safety, the glider feature self-locks while reclining. Turn your living room into a relaxing retreat with this set of reclining furniture. With cozy seats, bustle backs and one-piece chaises, these pieces offer full support and comfort. Along with being comfy and cozy, this collection offers many stylish elements to liven up your living room. Exposed stitches, soft gray fabric and nail head trim make these pieces unique and elegant. The chair, love seat and sofa are all available with manual and power reclining options. The Daniel collection is a great option if you are looking for Traditional furniture in the Kansas City Area: Liberty and Lee's Summit, MO & Overland Park, KS area. Browse other items in the Daniel collection from Crowley Furniture & Mattress in the Kansas City Area: Liberty and Lee's Summit, MO & Overland Park, KS area.